Top class outdoor aluminum wedding event tent serves first-class events. The venues need to be suitable for various purposes from hospitality villages, public catering, merchandising outlets to sponsor lounges. You also want to build in flexibility in case of bad weather or unexpected number of visitors. You should provide a warm welcome for your guests and leave them with a lasting impression. So your event will help to optimise their experience and ensure their loyalty. Aluminum structure tent with transparent roof cover and sidewall from Liri Tent vendor is perfect space solution for your wedding event ourdoor. 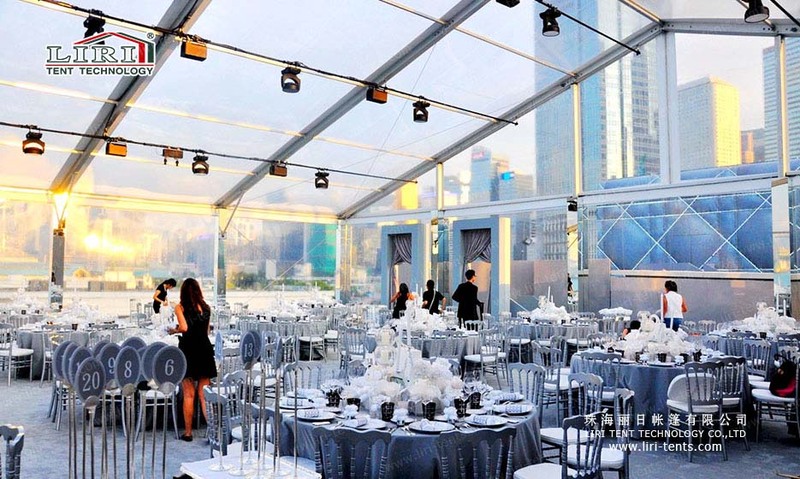 Material of transparent PVC is waterproof and all the guests inside the tent can enjoy the moment under the sky. To make it easy for you, we also offer supplementary facility services, such as lighting, heating, cooling and interior furnishing. Liri’s products and ancillary services will give your temporary venue the layout and look you require.